« It’s Turtle Crossing Time! I recently spent three days visiting gardens in Richmond, Virginia, while on a tour with the Annapolis Horticulture Society. I adore spending time wandering through gardens I haven’t seen before, and this trip proved to be perfect. The weather was gorgeous, the tour was impeccably well-planned, and the gardens were beautiful and varied. Plus the bus was filled with fun and interesting fellow plant nuts. Needless to say, we all had a great time. Above: All the gardens featured mature clumps of perennials. Large clumps or drifts are especially eye-catching and help anchor beds and borders. For this use, great cultivars are especially worth the investment. This is hosta ‘Risky Business’. For me, visiting mature, well-cared for gardens has a down side, though. I quickly become overwhelmed at the thought of my garden-in-progress waiting for me at home. Yes I have some sections that look great, but none of these Richmond gardens have the great swaths of weeds that I’m still planning to tackle or the undeveloped edges that still need my attention. I found myself thinking, “There’s no way my garden will ever be as…” You fill in the blank—gorgeous, lush, colorful, compelling, well-designed, well-maintained. I could go on. I’d forgotten an essential point. My garden isn’t supposed to be like anyone else’s, and I certainly have no business getting worried that it isn’t in the perfect form that gardeners strive for when they’re getting ready for a tour bus to visit. Talk about unfair comparisons! 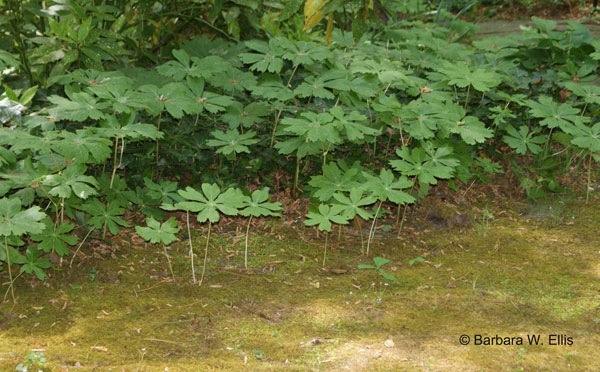 Above: In one of the woodland gardens on the tour, native may apples (Podophyllum peltatum) edge a moss lawn. I’ve been nurturing moss in my garden as well, although my drifts of it still have more weeds! Plus, what I love about gardening is the digging and moving and experimenting part. Like all gardens, mine is a work in progress, and I love that aspect of it. I know I’ve said it when I’ve given talks, but it’s so easy to forget: First and foremost, a garden should make its creator happy. For the most part, mine does, as long as I’m not walking through other ones that are older, better maintained—well, you can fill in the adjectives here, too. 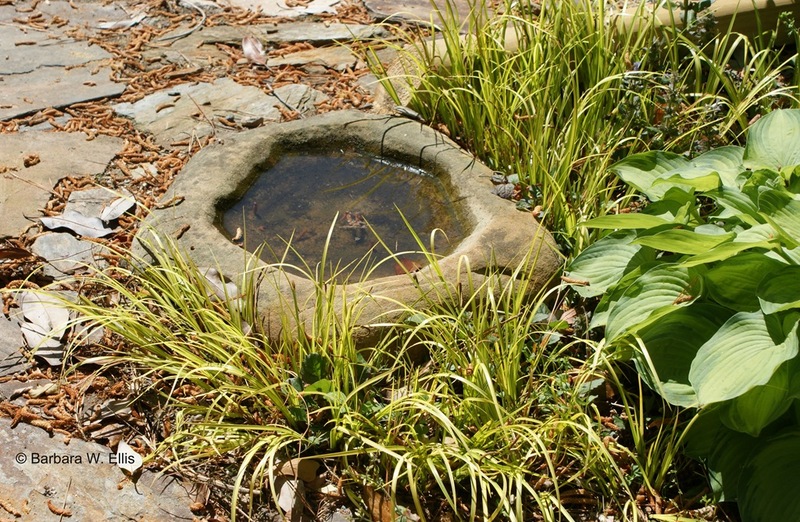 Above: Water features always add great appeal, and the gardens we visited included everything from ponds to small containers filled with water. Even a simple dish provides a place for wildlife to drink. Be sure to have a supply of Bt (Bacillus thuringiensis) on hand to control mosquitoes. Mosquito Bits is one brand. So, in order to visit and really appreciate these wonderful gardens without running down my own, I started to look at details. You’ll find pictures of a few more of them below. Once I started looking at elements that made a particular garden or planting unique and appealing, I got my bearings again. It stopped me from running down my own garden in my mind. As a result, I came home from Richmond with loads of ideas and, more importantly, enthusiasm for carrying on. I hope the garden features in this post give you ideas of elements give you ideas you can use as well. 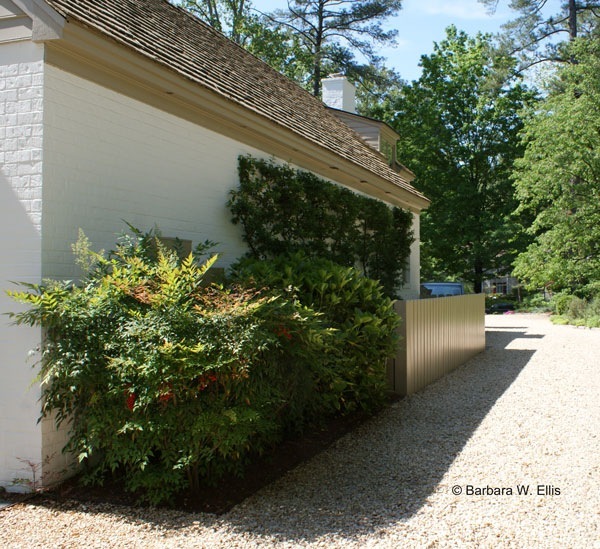 If you are participating in any of the Maryland House and Garden Pilgrimage dates (Kent County is May 14th), I hope looking at details will help you come away with new ideas and enthusiasm for your own garden. Above: This homeowner chiseled out enough bricks to make room for several clumps of hostas. The overall effect was lovely and helped link a large terrace to the garden. 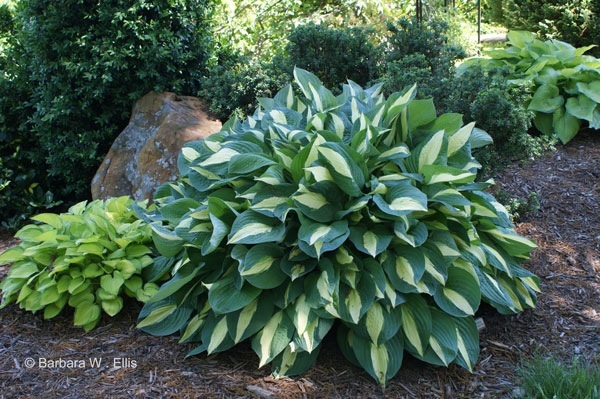 The plant wasn’t labeled, but hosta ‘Golden Tiara’ would work in a situation like this one. Above: It always pays to look at how utility areas are handled in a garden. Here, the fence hides air conditioners, and the arrangement leaves enough room for a driveway that leads around the house. Above: Vines don’t always have to grow up! 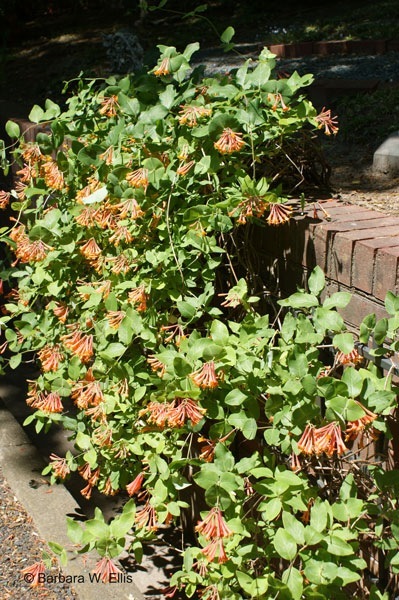 This honeysuckle is growing in the bed above this brick wall, and the vines have been trained down onto a trellis below. 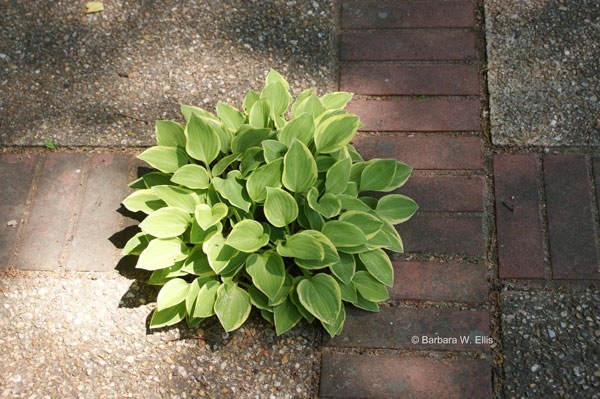 Above: A dense combination of ground covers makes a lovely carpet for a shaded spot. 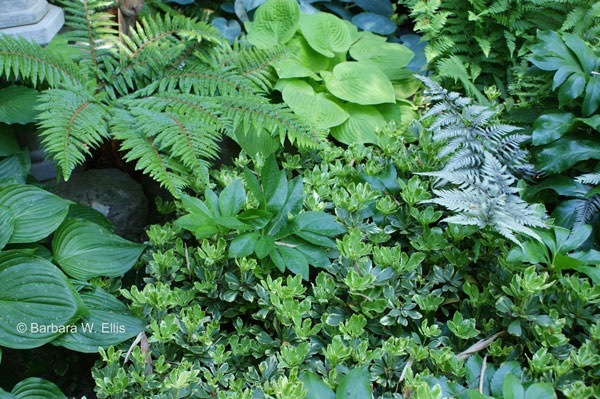 This low-maintenance combination includes ferns, hostas, and variegated pachysandra. Above: Texture plays an important role in creating this handsome combination. 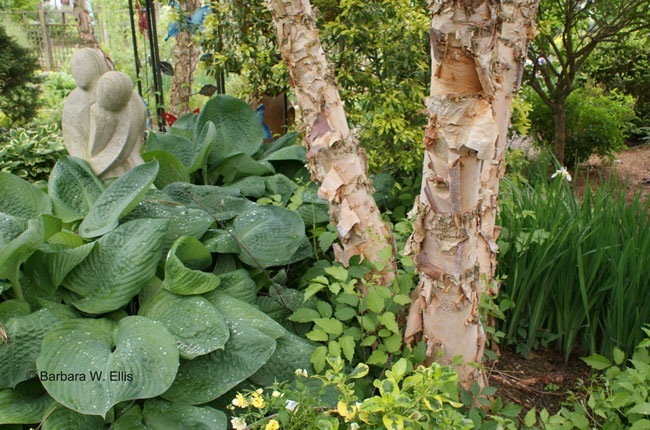 Rough, exfoliating bark of river birch (Betula nigra) contrasts nicely with grassy iris and lush hosta leaves. Above: Garden ornaments don’t have to break the bank. 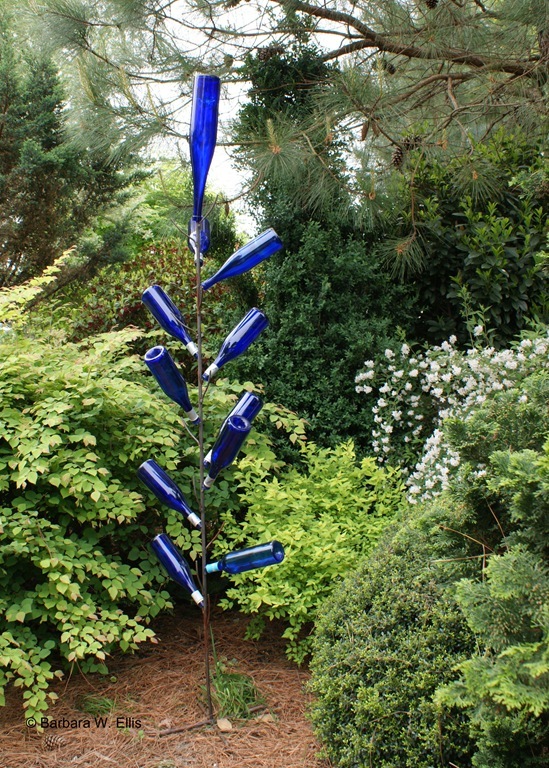 This bottle tree brings color and whimsy to a quiet corner. Glad you agree! It’s so easy for me to get caught up in how my garden doesn’t measure up, regardless of whether the comparisons make any sense. Looking at details helped get me out of that mindset, and I’m glad it struck a cord. I may have to do another post on the trip. This one may be on great plants I don’t have yet! I live in Richmond, so you can imagine how inadequate I must feel driving thru town and observing all of the beautiful yards and gardens! I just remind myself that when I “growup to be a real gardener”, my yard will look like that some day, but in the meanwhile I am going to enjoy the process and delite in reading your blog. Thanks Barbara. You sure have loads of inspiration down there, but I can imagine it can get intimidating. Just remember that the most important thing you garden should do is make you happy. If you have a great 3 x 3 plot, or even a container garden that makes you smile every time you look at it, you’ve felt the most important benefit of gardening! Barbara, I stumbled onto your blog while writing one of my own and linked yours to mine. I love gardening too, and one of my recent blogs was on garden art that I found. Mine is more of an inspirational post, but I just loved your pictures and heart for gardening, so I wanted others to see it! Thanks for posting these beautiful pictures. Greetings! Glad you found your way to Eastern Shore Gardener. I’m always looking for garden art, too, and it’s so hard to find things that are affordable! Keep checking back for a new post on the trellises my husband has started welding for me! I’ve been out in the garden too much to write it, but will get to it soon!